Product #17293 | SKU VHUBSMART6G1212 | 0.0 (no ratings yet) Thanks for your rating! 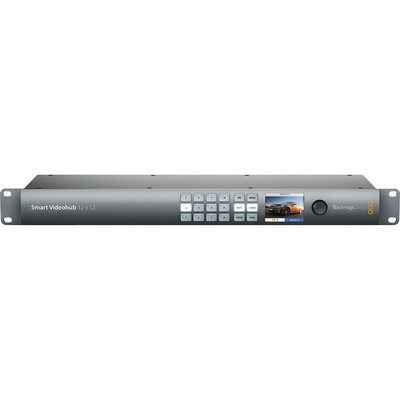 The Smart Videohub 12 x 12 6G-SDI from Blackmagic Design is a mixed format router with 12 6G-SDI inputs and 12 6G-SDI outputs for routing any combination of SD, HD, Ultra HD 4K, and DCI 4K video. It supports 4:2:2 and 4:4:4 colour sampling and 10-bit processing for smoother gradations. Housed in a 1RU frame, the Smart Videohub ideal for use in both large broadcast systems or portable mini racks for live productions. A built-in LCD lets view your sources directly on the router itself, with simple push buttons and spin knob provided for control. Routing can also be controlled using dedicated remote panels or over Ethernet using the included software for Mac OS X and Windows. You can even use the available iPad app to change routing over your wireless network.